Yelp is a cornerstone review website for millions of business owners and consumers. Dental, veterinary and optometric service searches are among some of the most popular. 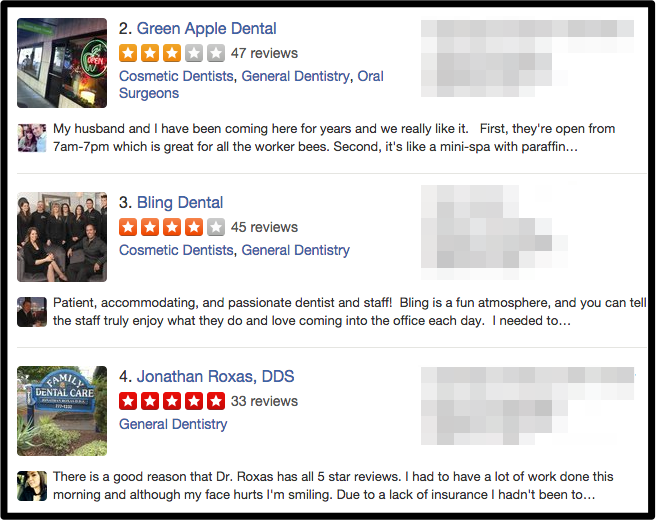 Many practitioners are capitalizing on Yelp reviews and reaping the rewards. Millions of potential clients and customers use Yelp every day to make service purchasing decisions, and in no field is critical decision making more prominent than in the field of personal and pet health. Yelp had an average of approximately 135 million monthly unique visitors in Q4 2014. Yelp users have written over 71 million local reviews! This is especially important to your practice and how others view your credibility. In addition to reviews, you can use Yelp to find events, lists and talk with other Yelpers. Every doctor/owner (or office manager) can set up a free account to post photos and message their customers. Yelp makes money by selling ads to local businesses. You’ll see these clearly labeled “Yelp Ads” around the site. This is similar to what Google offers in their search engine. Paying advertisers can never change or reorder their reviews. Yelp uses automated software to recommend the most helpful and reliable reviews for the Yelp community among the millions that they get. The software looks at dozens of different signals, including various measures of quality, reliability, and activity on Yelp. The process has nothing to do with whether a business advertises on Yelp or not. You can access Yelp via iPhone, Android, and more. This makes your practice easily accessible. Here is a real life example of what your potential patients or clients might see. You can see that I conducted a search for “dentist” near “Portland, OR”. On this search over 2000 “dental” related services come up! All of these examples (click here to view) are very near each other in physical location. You can see there is spectrum of ratings: 3 stars, 4 stars and 5 stars. I am interested in this topic. I would like to receive no-cost, no-obligation personalized guidance on using Yelp reviews for my practice (highly recommended).